- Obama Administration Sentences Sage Grouse to "Purgatory"
I've been thinking more seriously about spring for the last week, culminating in a five day exploratory trip to the Hells Canyon country between between Oxbow and Hells Canyon Dam. The result is, that I am just now posting some info from environmental organizations and other sources on the "better than nothing. " near purgatory status given to the actually endangered Greater Sage Grouse this last Friday, March 5th. 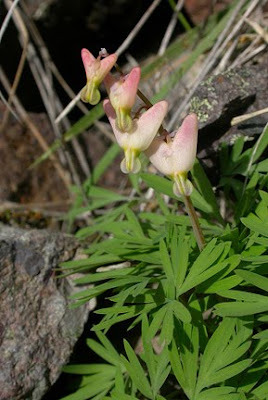 The links and other information about the sage grouse decision can be found immediately below the next photo of Dutchman's Breeches, which is a very early and immensely attractive perennial wildflower related to the native and ornamental Bleeding Hearts found in Baker City back yards. 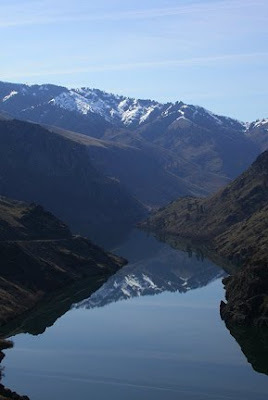 It can be found in the side canyons of the Snake River of Oregon and Idaho, and is also found in Washington state here in the North West. Elsewhere, it is very widely distributed from the mid-west, south to Georgia, but not in our other western states. 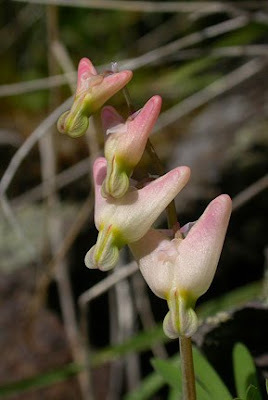 Other early spring wildflowers that can be found blooming in Hells Canyon right now are Lomatiums, Yellow Bells, Sagebrush Bluebells, Sagebrush Buttercup, and what I think might be Arabis crucisetosa, a comparatively small and delicate "rock cress." I'll try to post some photos of those plants in a later post. Obama/Salazar Send Sage Grouse to the Old Species Nursing Home, or is that Purgatory? “warranted but precluded” is sort of the endangered species Newspeak equivalent of an old folks nursing home or hospice, where endangered species lie around without care in a sort of political purgatory. During this period, the powerful interests, like ranchers and energy companies, who have been the largest contributors to the species' decline, continue their destructive and sinful ways with half-hearted, often laughable, "mitigation," all the while praying alternately for the species' improbable survival on small reservations, or for their ultimate demise. Seven years after conservationists petitioned to protect greater sage-grouse under the Endangered Species Act, Secretary of the Interior Ken Salazar announced today that the species is “warranted but precluded” from listing under the Act. The grouse will now join more than 270 imperiled species on the list of “candidate species” under the ESA. The decision marks the agency’s second attempt to assess the species for listing after the Bush Administration published an ecologically flawed, politically tainted decision not to list the grouse in 2005. The greater sage-grouse is a charismatic bird that lives in sagebrush steppe in eleven western states. First described by Lewis and Clark in 1805, nineteenth century travelers and settlers reported seeing huge flocks of sage-grouse that darkened the sky as they lifted from valley floors. However, westward expansion and development over the next 200 years eliminated almost half of sagebrush habitat. The total sage-grouse population, estimated between 140,000-500,000 birds, has declined between 69-99 percent from historic levels. “The action by Secretary Salazar and the U.S. Fish and Wildlife Service comes years too late as hundreds of thousands of acres of sage-grouse habitat have been permanently altered or reduced in value for this charismatic native species since the initial petition for listing,” said Dr. Clait Braun, Director of Grouse, Inc. “Some populations are already at the brink of extirpation in each of the states where this species persists.” Dr. Braun, retired Avian Research Program Manager for the Colorado Division of Wildlife, has been involved with sage-grouse research and management since 1973. The Fish and Wildlife Service’s finding indicates that current conservation efforts are failing to conserve sage-grouse. The grouse’s new status as a candidate species may require agencies such as the Bureau of Land Management to revise their land use plans on public land to improve habitat for sage-grouse and other sagebrush species. The Sagebrush Sea Campaign, a program of WildEarth Guardians, was the lead petitioner to list the greater sage-grouse under the Endangered Species Act. Western Watersheds Project, a western conservation organization, successfully litigated a remand of the negative listing decision in 2007. 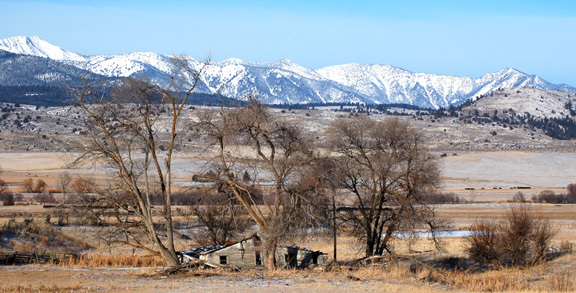 Advocates for the West represented Western Watersheds Project in federal court. More than twenty conservation groups joined the petition to list sage-grouse under the ESA in 2003. Video and images of sage-grouse, factsheets on sage-grouse and the Sagebrush Sea, and maps of sage-grouse range and land use in the West are posted at www.sagebrushsea.org. WASHINGTON — The Interior Department said Friday that the greater sage grouse, a dweller of the high plains of the American West, was facing extinction but would not be designated an endangered species for now. Yet the decision in essence reverses a 2004 determination by the Bush administration that the sage grouse did not need protection, a decision that a federal court later ruled was tainted by political tampering with the Interior Department’s scientific conclusions. Interior Secretary Ken Salazar, a conservative Democrat from a Colorado ranching family, sought to carve a middle course between conservationists who wanted ironclad protections for the ground-hugging bird and industry interests and landowners who sought the ability to locate mines, wells, windmills and power lines in areas where the grouse roam. As a compromise measure, he said, the bird will be placed on the list of “candidate species” for future inclusion on the list and its status will be reviewed yearly. The middle-ground decision is typical of Mr. Salazar’s stewardship at the Interior Department, where he has tried to mediate between competing energy and environmental interests. Like many previous decisions, including compromises on oil drilling in Utah and habitat protection for the polar bear in the Arctic, Mr. Salazar’s action left both sides somewhat disgruntled. Residential building and energy development have shrunk the sage grouse habitat over the past several decades, causing its population in 11 Western states to dwindle from an estimated 16 million 100 years ago to 200,000 to 500,000 today. He said that state resource agencies would be instructed to take stronger steps to preserve the sagebrush where the birds live. Federal wildlife and lands agencies will oversee those efforts. In 2004, the Bush administration Interior Department decided against listing the sage grouse as endangered or threatened, despite reports from agency scientists that the bird and its habitat were in jeopardy. Three years later, a federal judge ruled that a senior Interior Department political appointee, Julie MacDonald, had intimidated agency scientists and overruled their findings. She later resigned from the department over several similar incidents. The judge ordered the department to review the sage grouse decision, which led to Friday’s announcement. A group of lawmakers from Western states had strongly urged Mr. Salazar to keep the sage grouse off the endangered species list, saying that the states had made significant progress in protecting its habitat. They said adding the bird to the list would hurt ranchers and energy producers who need access to sagebrush-covered lands that would be off limits under the listing. “Today’s unnecessary federal designation is one more on a growing list of examples that this administration places environmental special interests before job creation,” Representative Rob Bishop, Republican of Utah, said Friday. “Not only is today’s announcement a direct attack on the hundreds of Western communities that depend on access to federal lands for ranching, livestock, mining and energy production, it also could potentially destroy opportunities for development of our renewable resources,” he said. Brian Rutledge, Rocky Mountain regional director for the Audubon Society, said he agreed with Mr. Salazar that other species were facing greater danger. But he said he hoped the decision to make the sage grouse a candidate for endangered species protection would mean that state and federal agencies would act much more aggressively to protect the bird’s threatened habitat.